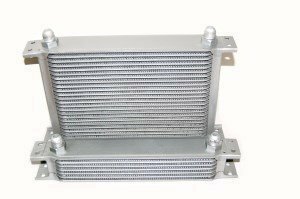 Race.Fi oil coolers for engines, transmission and other purposes. A sturdy but light build with good cooling capabilities and AN-fittings. 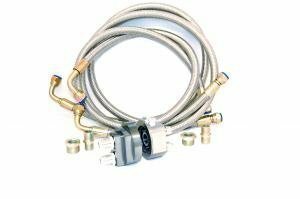 The Race.Fi oil cooler kit comes with long AN-fitted stainless steel braided hoses and a precision manufactured sandwich plate with two extra sensor holes. The Race.Fi oil filter relocation kits eases oil filter change for easy access. 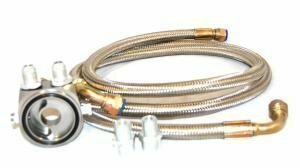 Three stainless steel braided hoses allow for an oil cooler to be installed, if needed. AN-fittings. An uprated oil filter sandwich plate used to replace the original oil filter mounting. 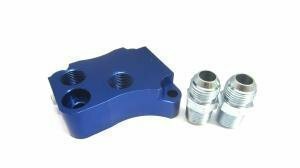 To be used with an oil filter relocation kit.This adapter both saves space and allows a quality installation of an oil cooler kit.